All prescriptions for compounded natural hormones are filled by the Integrative Health Center and Pharmacy. We are known for the support we provide for the men and women who trust us with their most important possession-their health. To benefit from ALL of our special customized services, including ongoing long term support from our staff AND Jeff Hogrefe, R.Ph., as needed, you will need to continue to have your prescriptions filled at the Integrative Health Center and Pharmacy. New prescriptions: It will be necessary for your practitioner to fax (937-773-0643), mail or bring your prescription into the Integrative Health Center and Pharmacy. You may also have your physician call in your prescription to 937-773-1778 or toll free 888-723-5344. Refill prescriptions: Simply complete the form below allowing 5-7 business days for your order to be processed. Document under the comment section below if you would like your prescription(s) to be mailed or if you would like to pick up your prescription at the Integrative Health Center and Pharmacy. In addition, if you would like to re-order any nutritional supplements or if you have any additional information that may be pertinent to your prescription refills, please document those requests under the comment section. Please note: You may also call the pharmacy at 937-773-1778 or toll free 888-723-5344 to speak with one of our friendly staff members or to leave a message 24/7 with your request. How can iRefill Mobile benefit you? 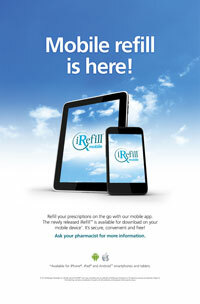 Please see the iRefill Mobile User Guide for instructions on how to use iRefill on mobile.